MGM Resorts International's three prong attack to solving the early woes of ARIA's befuddling first six months has inserted its second prick into their flagship $10B miasma, the release of an ARIA iPhone app. So far, sliding in the other two tips - adding more lights to the casino floor and strategically placing shrubbery around the harder edged portions of the CityCenter complex - haven't been particularly successful. Where did you guys put the bush anyways? The ARIA iPhone app, much like the MGM Grand and Mandalay Bay iPhone apps, is exhaustively thorough in its depth of content, words certainly did not fail here. The apps 80 odd pages are chock full of descriptions, photos, menus and infinite ways to contact nearly every department in the resort. Need to contact an ARIA casino host? Done. (If you do call 702.590.7757, and ask for Cathy, and tell her that VT sent you - she loves us!) Stuck in the Omaha airport and need to fill out a gigantic and barely legible marker application before landing? Done! One of the features of this app touted by MGM CEO Jim Murren was the presence of a CityCenter Public Art Walk guide. It took me about 20 minutes of poking around before I found it, I even tried to search for the term "Pocket Park." 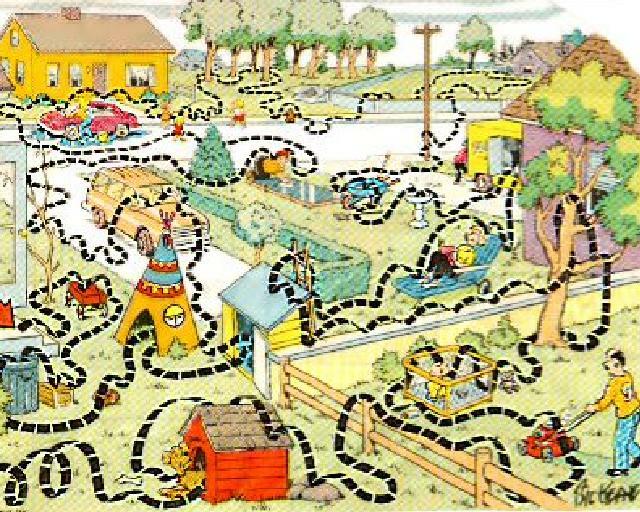 What I found isn't really a guide but a Family Circus style map. No art curator voiceovers, no "at the top of the stairs is a giant typewriter eraser!" GPS pings, no photos, no descriptions or background. For all the mentions of "pocket parks" during the run up to ARIA's opening, it isn't even listed on the map! So is this app any good? If you are going to ARIA and want a resort guide at your fingertips? Definitely, mostly, I would be using this to call the front desk when your key card doesn't work because in my experience, the house phone in the hotel tower didn't work at 4:30am. Oh, and also cause it's just cool. Dorques. Big thanks to CanadianCrapShooter for the tweet tip. I just love that there's a tutorial for the in-room remote. The irony here is that if you can work an iPhone, that remote shouldn't give you much of a problem. Big LOLZ @"Family Circus style map." Do we get to see the circuitous path that Dolly, Jeffy, and TJ take to get to MO from Vdara?